Are you embarrassed by your stained, crooked, old, or broken-down teeth? A smile makeover creates a beautiful new smile that will make you look younger, happier, and healthier. Under the gentle and expert hands of Philadelphia restorative dentists and Philadelphia cosmetic dentists Dr. Ken Cirka, Dr. Jessica Meier, Dr. Mimi Jeon and Dr. Stephanie Smith you will walk away from our Center City dental office with a perfect smile that looks amazing, functions perfectly, and gives you a new lease on life. These concerns and more can be addressed and corrected at our Philadelphia dental office. Remember too that many of the oral health problems you’re dealing with can have long-term health complications. Tooth and gum problems can lead to an increased risk of heart disease and diabetes as well as malnutrition. If you can’t eat the chewy and crunchy foods you need to keep you healthy, your diet and body will suffer. Your smile makeover may consist of one procedure or several procedures. It may be a combination of cosmetic dentistry and restorative dentistry. There is no one way to go about a smile makeover, and your new smile will be customized specifically for your oral health needs. Porcelain veneers: Many of the mega-watt smiles of celebrities come courtesy of porcelain veneers. You can achieve the same enviable white and flawless smile with your own set of customized veneers that are resistant to stains. All-porcelain tooth crowns: When your tooth is disfigured, oddly shaped, or too damaged to repair with a filling or onlay, all-porcelain tooth crowns cap the tooth to protect it and make it look natural and healthy. Invisalign: It takes a little time, but an Invisalign smile makeover aligns your jaws and teeth so your smile is strong, properly positioned, and ready for any aesthetic upgrades you want, like teeth whitening. Teeth whitening: One of the most popular cosmetic dentistry procedures, teeth whitening works on any kind of healthy smile, boosting your smile wattage tenfold, and making even slightly flawed teeth look just right. Dental implants: Missing teeth not only jeopardize the positioning of neighboring teeth, their absence can change the shape of your face over time. Dental implants replace the tooth root and the actual tooth with an implant and prosthetic tooth. Lumineers: A less-invasive version of veneers, Lumineers are sometimes referred to as no-prep veneers. They require very little work to get your teeth ready to be bonded to the incredibly thin pieces of transformative porcelain. Dental bridges: Gaps in your smile from missing teeth can be corrected with a permanent and secure dental bridge anchored on either side by porcelain crowns. Don’t settle for a smile that is less than perfect. Allow our team at Philadelphia Dentistry to create the straight, full, flawless, white smile you have always wanted. Your family, friends, acquaintances, and colleagues will be amazed by your transformation when you get a smile makeover. Not only will your appearance be enhanced, your confidence will be supercharged to give you the strength to go about your days feeling good about yourself, doing good things for yourself, and doing good for others. Invest in a strong, healthy, functional smile that is easy to care for, pain free, and looks naturally beautiful. 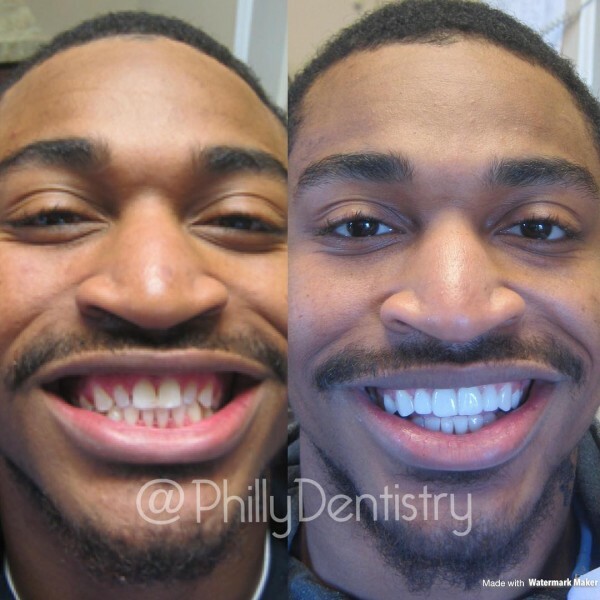 Contact Philly Dentistry to schedule your consultation and discover what smile makeover options await you.